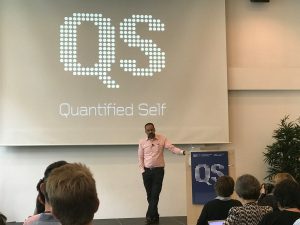 I participated in the QS2017 conference June 17-18 in Amsterdam – two very intense days as I had committed to do four different talks/breakouts during the conference. Together with Quantified Self Institute we did a breakout on QS research. Thomas Blomseth Christiansen and I organized a workshop/breakout session on Tracking Subjective Experience. I organized another breakout session about food tracking, which included a group of people with type 1 diabetes. And finally I did a show and tell talk about longitudinal tracking of sleep and resting heart rate. This entry was posted in blog and tagged conference, presentation, quantified self, workshop by Jakob Eg Larsen. Bookmark the permalink.